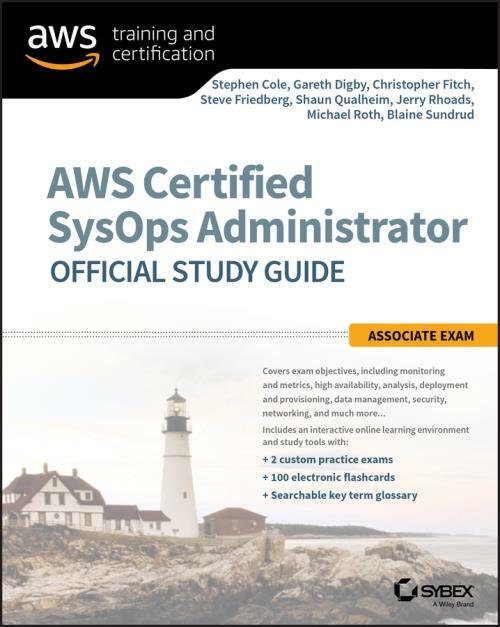 The AWS Certified SysOps Administrator Official Study Guide is your one–stop resource for coverage of the AWS Certified SysOps Administrator Associate Level Exam objectives. You'll prepare smarter and faster with Sybex thanks to expert content, including assessment tests that check your exam readiness, an objective map, real–world scenarios, hands–on exercises, key topic exam essentials, and challenging chapter review questions. Reinforce what you have learned with the Sybex online learning environment and test bank, accessible across multiple devices. Get prepared for the AWS Certified SysOps Administrator Associate Level Exam today. - Interactive test bank with 2 practice exams. Practice exams help you identify areas where further review is needed. Get more than 90% of the answers correct, and you're ready to take the certification exam. 100 questions total! - 100 electronic flashcards to reinforce learning and last–minute prep before the exam. - Comprehensive glossary in PDF format gives you instant access to the key terms so you are fully prepared. - FREE access to Sybex's online interactive learning environment and study tools for one year. AWS Certifications recognize IT professionals with the technical skills and expertise to design, deploy, and operate applications and infrastructure on AWS. Exams are offered in multiple languages at testing centers around the world. The AWS Certified SysOps Administrator Associate Exam is intended for individuals with experience automating and creating repeatable deployments of networks and systems on the AWS Cloud.